The PLEASE Painless Laser Epidural System uses a laser to create skin micropores; high molecular weight drugs are thereby delivered painlessly. A handheld laser device creates controlled aqueous micropores in the epidermis. Due to the special features of the device the micropores do not reach the dermis, where nerves and blood vessels reside. 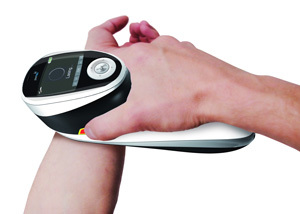 An intelligent graphical user interface guarantees simple and safe use by the medical personnel or the patient, who can use the device without supervision A special laser source ablates outer skin tissue painless in a highly controlled and accurate fashion. 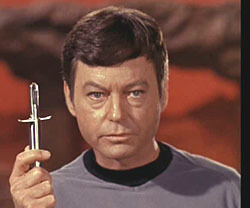 SF fans will no doubt be thinking about the hypospray, the universal injection tool in the Star Trek universe. From PLEASE press release via MedGadget.